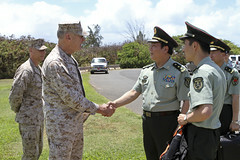 In “Embracing the Moon in the Sky or Fishing the Moon in the Water” in the July-August 2012 issue of Air & Space Power Journal, Senior Colonel Xu Weidi at the PLA‘s National Defense University Institute of Strategic Studies offers his thoughts on the effectiveness and limitations of deterrence. Col. Xu points out (correctly, I think) that the deterrence implicit in the strategic arms race conducted between the USSR and the US between 1945 and 1989 way have prevented nuclear war, but at great cost. Further, Xu reads the history through Sun Tzu’s lenses and finds our current understanding of deterrence as a strategic concept needs more nuance. This entry was posted in China, National Security. Bookmark the permalink.